Thread: Any affordable options to eliminate the XLR cables to my active loudspeakers? The biggest problem with bluetooth is going to be latency. Quality isn't bad these days, with Bluetooth 4.1 having a decent amount of bandwidth for shoving data around, but 50ms+ of latency is going to mess things up for you, even if the average bluetooth user doesn't mind. VHF wireless systems, like the ones used for guitars, mics, and in-ear monitors, are where I'd start looking. Not gonna be cheap, though. You’d need a pair... one on each end, but it uses a single CAT5 cable through the wall to the wall plate. 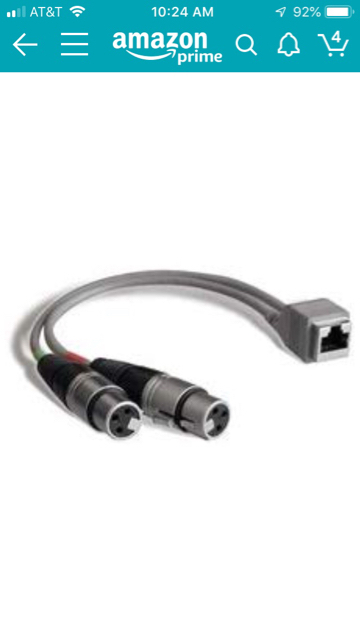 I’ve used this product to connect my controller (inside a case) to a RJ45 jack on the back of my rack, and then to the mixer in the rack. It works beautifully and it was an easy one click RJ45 connection . I don’t remember paying $50 a piece, but it looks like that’s what they’re selling for. I don’t use mine anymore since I don’t use a separate controller/case. My controllers are now mounted in my rack, so I can use short XLR cables for my connections inside the rack. Last edited by DJ Bobcat; 03-11-2019 at 10:40 AM.